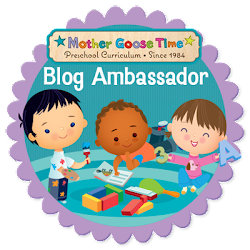 Part of my role as Blog Coordinator for Mother Goose Time is to read through all the Blog Ambassador's posts. The only major issue with this is that it always gets me excited to open up a bag and have some fun with my kids, so I can never seem to get through too many posts at a time! One of the other bloggers, using Mother Goose Time at a preschool, showed how she used the what we know, what we wonder and what we learned page that is at the front of each week. She had written the three columns on a white board and asked the students to fill in the first two columns. I have been using Mother Goose Time for years now, yet I still find something new to try. The curriculum is so rich and deep that you can always find a new area to add another level to your teaching. First I asked Peter (6) what can be found in a bird's nest. He said "baby birds and eggs". Then I asked him what he wondered about bird's nests and he said he wants to know the different ways birds build their nests. Next I asked Adam (just turned 3) what he knew about nests. He said "birds nests are up in the air" (translation, up high) and that they are a "birds house". See! Look at that! I love his answers. Now what does Adam wonder about nests? Since this is a new concept to him I got some fun answers. He said he wants to "know about Jesus", horses and dogs. I can't wait to ask them both what they learned at the end of this week about birds. I started by setting up two trays at the table for the Nest Invitation to Create. I didn't set up three because Lachlan has been opting out of participating lately. To my surprise, he made a nest and Peter did not. After getting the table set up I made a nest out of blankets in the living room for the Circle Time song. It was quickly occupied by an adorable little hatchling. I quickly reminded Lachlan that the tops of the paper bags can be rolled down to make it look like a nest. I could have stepped back and not said anything, but Lachlan does not like making things unless they turn out like he envisions them in his mind. He would have gotten really frustrated if it didn't look like a nest. Adam was mostly interested in cutting the little pieces of crinkly paper that Mother Goose Time provided as part of this art project. The inspiration photo had hatchlings in the nest with their yellow beaks open and waiting for food. That's why the yellow paper was provided. But neither of the boys chose to do anything with the colored paper. Next I grabbed the "nametags" for this month which are paper eggs. I had each child write their name on their egg and I wrote Mom on the extra one. The nest says "Who is in the nest today?" and it's a way to see who is in class each day. If a person is not their, their egg can be placed outside the nest. I need to make one more egg and put Dad on it so that we can move it in and out of the nest when he goes to work and comes home. I think Adam would have a lot of fun with that. I have it right at Adam's height and he asked me just once, which egg said what. I read them to him and he had them memorized instantly. He goes to the nest each time a new person comes over to visit and "reads" the name on each egg. I say "read" in quotes, but maybe I shouldn't. He is actually reading and recognizing the names, letters, and also the colors and drawings on each egg to tell them apart. Such a great pre-reading exercise for his brain! Lachlan added glue and then crinkled paper to the top and inside of his nest. This is why Peter was not making a nest. He was making creatures out of construction paper. Lachlan then decided he would make a real nest and went out to gather sticks. He said that some birds make their own glue by chewing and spitting up something. That is why it was okay for him to use Elmer's glue to make his nest. It didn't quite stay together. Later he decided to add them to the top of his paper nest. The last activity on this day about nests was called Stick Stack. We were given numbers for our pocket cube, a picture of a nest and Popsicle sticks. The numbers we could use in the pocket cube included negative numbers. I used -1 and -2. The idea was to roll the cube and put that many into the nest, or if they were negative numbers, take that many out. I set it up, as you see here, but we never did play it. So when we were heading out the door to go to Great Grandma's house, I grabbed it and packed it along. GG has many beautiful and breakable things at her house, so if Adam started getting wrestless I wanted something to do. This was a perfect solution, and we did use it! Another win for Mother Goose Time.